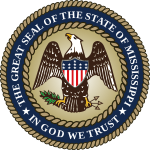 Mississippi is a state locatit in the sootheastren region o the Unitit States. 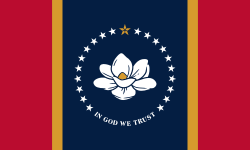 Mississippi is the 32nt maist extensive an 32nt maist populous o the 50 Unitit States. It is mairchit bi Tennessee tae the north, Alabama tae the east, the Gulf of Mexico an Louisiana tae the sooth, an Arkansas an Louisiana tae the wast. The state's wastren boundary is lairgely defined bi the Mississippi River. Jackson, wi a population o approximately 175,000 fowk, is baith the state's caipital an lairgest ceety. The state is hivily forestit ootside the Mississippi Delta aurie, that is the aurie atween the Mississippi an Yazoo rivers. Afore the American Ceevil War, maist development in the state wis alang riverfronts, as the watterweys wae creetical for transportation. Lairge gangs o sclaves war uised tae wirk on cotton plantations. Efter the war, freedmen begoud tae clear the bottomlands tae the interior, in the process sellin aff timmer an buyin property. Bi the end o the 19t century, African Americans made up twa-thirds o the Delta's property awners, but timmer an railwey companies acquired muckle o the laund efter the financial creesis, that occurred whan blacks war facin increasin racial discrimination an disfranchisement in the state. Clearin o the laund for plantations altered the Delta's ecology, increasin the severity o fluidin alang the Mississippi bi takkin oot trees an bushes that haed absorbed excess watters. Muckle laund is nou held bi agribusinesses. A lairgely rural state wi agricultural auries dominatit bi industrial farms, Mississippi is ranked law or last amang the states in sic meisurs as heal, eddicational attainment, an median hoosehaud income. The state's catfish aquacultur farms produce the majority o farm-raised catfish consumed in the Unitit States. Syne the 1930s an the Great Migration o African Americans tae the North an Wast, the majority o Mississippi's population haes been white, awtho the state still haes the heichest percentage o black residents o ony U.S. state. Frae the early 19t century tae the 1930s, its residents war majority black, an afore the American Ceevil War that population wis componed lairgely o African-American sclaves. Democratic Party whites reteened poleetical pouer throu disfranchisement an Jim Crow laws. In the first hauf o the 20t century, nearly 400,000 rural blacks left the state for wirk an opportunities in northren an midwastren ceeties, wi anither wave o migration aroond Warld War II tae Wast Coast ceeties. In the early 1960s, Mississippi wis the puirest state in the naition, wi 86% o its non-whites livin ablo the poverty level. In 2010, 37% o Mississippians war African Americans, the heichest percentage o African Americans in ony U.S. state. Syne regainin enforcement o their votin richts in the late 1960s, maist African Americans hae supportit Democratic candidates in local, state an naitional elections. Conservative whites hae shiftit tae the Republican Pairty. African Americans are a majority in mony coonties o the Mississippi-Yazoo Delta, an aurie o historic sclave settlement in the plantation era. ↑ 3.0 3.1 "Elevations and Distances in the United States". United States Geological Survey. 2001. Archived frae the oreeginal on October 15, 2011. Retrieved October 24, 2011. ↑ "Mississippi Annual State Health Rankings - 2013". America's Health Rankings. Retrieved October 5, 2014. ↑ "Percent of People Who Have Completed High School (Including Equivalency) statistics – states compared – Statemaster". Retrieved October 5, 2014. ↑ "State Median Household Income Patterns: 1990–2010". U.S. Census Bureau. Retrieved August 6, 2012. ↑ Kasher, Steven (1996). The Civil Rights Movement: A Photographic History, 1954–68. New York: Abbeville Press. pp. 132–135. This page wis last eeditit on 25 October 2018, at 20:34.